The director’s shrewd and witty approach to the material demonstrates his finely tuned sense of the absurd. 120 min. Summit Entertainment, LLC. Director: Roman Polanski. Cast: Ewan McGregor, Kim Cattrall, Olivia Williams, Pierce Brosnan, Timothy Hutton. Few filmmakers make a better case that the story is in the telling than Roman Polanski. The director’s eighteenth feature, the conspiracy yarn The Ghost Writer, exudes excellence in its confident rhythm and incisive attention to intellect and emotion; above all, there’s an ineffable je ne sais quoi to Polanski’s style, an audio-visual élan. Like other cinematic old masters, Polanski has his pick of top-tier talent. Ewan McGregor plays this mystery’s dogged flatfoot, a professional (unnamed) ghost writer hired to rewrite the autobiography of former Prime Minister Adam Lang (Pierce Brosnan). Disconcertingly, the ghost’s predecessor lately washed up on the shores of Cape Cod, not far from Lang’s seaside property. Though the circumstances are suspicious, the death is deemed an accident; still, no sooner does the new ghost arrive than a scandal involving Lang blows up in the press. Suddenly facing war crime charges, Lang appears to have authorized the illegal use of British Special Forces for a secret kidnap culminating in CIA torture. And with that, the book becomes a hot commodity, with editors demanding that the ghost cut his one-month work time in half. Paring down Lang’s windy tome will be no easy task. “All the words are there,” the ghost deadpans. “They’re just in the wrong order.” Adding to the pressure: the louche Lang’s hair-trigger temper; his wife (Olivia Williams), also emotionally unstable; and protestors swarming the property line. But all else pales next to a growing suspicion that Lang and his friends in high places have conspired to cover up yet more damaging secrets, secrets that just may have gotten one ghost killed and his replacement in mortal danger. 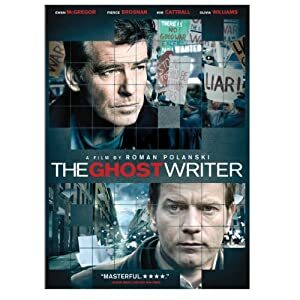 The plot of The Ghost Writer is serviceable, but it’s basically an “airplane read” elevated by dialogue (Polanski shares screenplay credit with the source novel’s author, Robert Harris). Unlike many of Polanski’s earlier exercises in the mystery, thriller and horror genres, from Chinatown to The Ninth Gate, The Ghost Writer isn’t much interested in well-placed shock tactics. The most delicious scene here is a long, squirmy dialogue between the ghost and Paul Emmett (Tom Wilkinson, superb): a high-powered old friend of Lang who would rather not be known for it. The director’s shrewd and witty approach to the material demonstrates his finely tuned sense of the absurd. Partly, he takes a personal interest in boundaries and the escaping of them; the story’s many gated communities seem to hold people in as much as they hold people out (and, ironically, Polanski had to finish cutting the film from jail). Polanski also tells several sharp visual jokes, at least one of which doubles as a metaphor: a servant sweeping up brush on the deck of the windy beachfront home. It’s as comically futile a task as anything any character attempts in the film. Summit delivers The Ghost Writer in a Blu-ray + DVD special edition that introduces the latest state of the art: a single flipper disc that is a Blu-ray on one side and a DVD on the other. I almost couldn't believe my eyes when I took a gander at this hi-def transfer: it's truly eye-popping in its depth, clarity, textures and razor-sharp detail (just-so light grain helps to retain the picture's film-like essence). Color is represented with great accuracy, and black level is inky. Obviously, there are no distracting digital artifacts: this is first-rate hi-def. The definitive DTS-HD Master Audio 5.1 soundtrack does an equivalent job with the picture's source audio: the mix is crystal-clear and immersive, retaining the subtle ambience heard in theaters. For the special features, Summit engaged the master: Laurent Bouzereau (he produced Universal's Hitchcock special editions, among many others).Although director Roman Polanski does not contribute a commentary, Bouzereau provides a neat triptych of interview featurettes: one with the story's author, one with the cast, and one with Polanski. All three featurettes weave in intriguing behind-the-scenes footage. "The Ghost Writer: Fiction or Reality?" (10:46, HD) features Robert Harris, the film's screenwriter and author of the novel on which the film is based. Harris discusses his work with Polanski, how they came to adapt The Ghost, the trickiness of the adaptation, the film's ending, and Polanski's working style, filmmaking genius, and commitment to the original novel. "The Cast of The Ghost Writer" (11:48, HD) finds Ewan McGregor, Pierce Brosnan, Olivia Williams, and Kim Cattrall talking about their characters, their castmates, and their director; co-producer Timothy Burrill also puts in his two cents. In "An Interview with Roman Polanski" (8:38, HD), the director discusses his collaboration with Harris, his love of the novel, the cast, his intentions for the audience, the film's ending, and his desire for the film to reflect the modern political landscape. 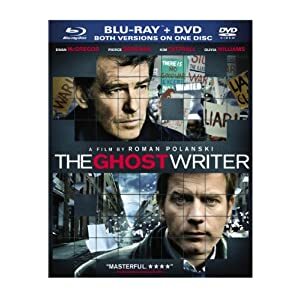 The Ghost Writer is one of the most satisfying films of the year, and I can unreservedly recommend the Blu-ray + DVD special edition. All site content © 2000-2019 Peter Canavese. Page generated at 04/17/2019 04:55:53PM.